You know when you buy a polish from an indie and once you get it you wish you bought more colors? I bought KBShimmer Spring Training on a whim and it is so spectacular I feel bad I didn't buy more colors I wanted. Granted, I really couldn't afford to buy more at the time, but ugh I hate that feeling! I think I'm going to need ever KBShimmer color ever made, because I just love this brand! 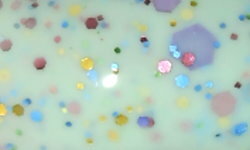 Spring Training is a soft mint green base with multi-colored/multi-sized pastel glitters mixed in. Spring perfection. I love and adore this to pieces. The base color is beautiful and the glitter is great. This applied like a dream. This is an all around wonderful polish. Yes, it has been added as a contender to my Top 20 of 2013 list that I started at the beginning of the year. Yes, I'd say this one is a must have. You need this. I love it, and I think you'll love it too! I purchased this polish for $8.75 on KBShimmer's webiste. This is the one I REALLY wanted from the new collection. I love her nail polishes. I got a couple from the holiday collection and have been wanting more ever since! I didn't order this polish because all I was focused on was the circle glitter but this is very pretty! I might nee to rethink my strategy, lol. this is so beautiful!!! And I know the feeling well Stephanie. I'm having it right now as I regret not ordering this one. Sigh. Lol, I share the circle glitter feels Amanda! I still haven't ordered any of the new KBShimmers because I can't get them all either and I just can't decide which to get. They're definitely one of, if not my favorite indie brand so I understand the urge to get everyone of their polishes. Oh this is cute! I prefer this over similar polishes that have a pink base. Woah, pretty! The colors of the glitter look so pretty in that minty base ♥. I agree, I need every KBShimmer ever made! My sentiments exactly! I reviewed a couple from the spring line, then I felt like I immediately needed to order the rest of the pastels. So pretty! Love the mint color with the glitter! Awesome color for spring time! Even though I'm not really a glitter lover..I have been wanting to try a couple of KB Shimmer polishes. I think they are so pretty and unique. Love this one...it's very springy!